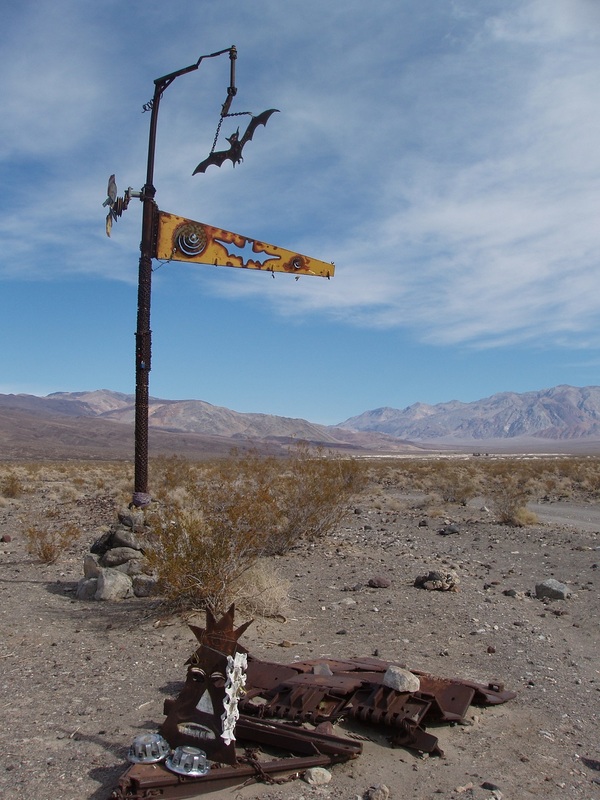 The Bat Pole is one of the historic art installations in Saline Valley. DEATH VALLEY, CA – Death Valley National Park invites the public to provide input into a proposed draft management plan for Saline Valley Warm Springs. Comments are due by July 2. Saline Valley Warm Springs are located in a remote northwest corner of the park, 35 miles from the closest paved road. The springs range from 61 to 117 °F. A history of counter-culture use from the 1950s through 70s resulted in developed soaking pools and art installations. The draft Saline Valley Warm Springs Management Plan and Environmental Impact Statement (EIS) is intended to provide a framework at the Saline Valley Warm Springs area for natural and cultural resources management, administration and operations, and managing visitor use. Fencing would be installed around the developed area to exclude burros. Officially designating the Chicken Strip airstrip as a landing strip through an associated rulemaking process, allowing it to remain open. Camping would be allowed at the airstrip. Camping permits would be required. Permits would be free at first, but a fee might be implemented later. Camping would continue to be limited to 30 days per calendar year. Dispersed camping will be allowed in designated areas. Remove non-native vegetation (including palms) from the Upper Springs. No replacement palms would be placed at Lower Springs when existing ones die naturally. Art that is found to be 50 years or older is considered eligible for the National Register. Art installations determined to be eligible would be managed in accordance with the National Historic Preservation Act. Non-historic art would be removed regularly to preserve the natural beauty of the area. 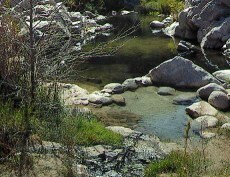 The document is available and comments may be submitted online at http://parkplanning.nps.gov/SalineValleyWarmSprings. Comments may be submitted by mail to: Death Valley National Park, P.O. Box 579, Death Valley, CA 92328. A limited number of paper copies are available at park headquarters as well as public libraries in Amargosa, Pahrump, Bishop, Lone Pine, and Ridgecrest. Sunday, May 27, 2018 from 1:00-2:00pm at the Saline Valley Warm Springs. Tuesday, May 29, 2018 from 5:30-7:30pm at the Ridgecrest Historical Society, 230 West Ridgecrest Blvd, Ridgecrest, CA 93555. Wednesday, May 30, 2018 from 5:30-7:30pm at the Inyo Council for the Arts, 137 South Main St, Bishop, CA 93514. Thursday May 31 at 5:30-6:30pm online via a webinar. People joining the web presentation should register at https://parkplanning.nps.gov/SalineValleyWarmSprings for the webinar link and call-in phone number no later than 15 minutes before the presentation begins. “The Bureau of Land Management, Ridgecrest Field Office, fully supports Death Valley National Park and their efforts to provide the public with a sound management plan for the critical resources in the Saline Valley Warm Springs area,” said Caroline Woods, Acting Assistant Field Manager.